Athirappilly Falls looking west towards the coastal plains near Cochin. At the falls the impressive tropical rainforest of the Vazhachal Division gives way to coconut and rubber plantations and densely populated settlements. The back road from the Valparai plateau to the Kerala plains offers one of the best opportunities to experience a Western Ghats tropical rainforest from the comfort of a vehicle. I’ve been hearing about the road and Athirappilly Falls near Chalikudi for many years. Shekar Dattatri had brought it to my attention when he recalled some of the shoots of nesting Great Pied Hornbills in Chalikudi for the 1988 film Silent Valley. This short trip to the Anaimalais finally offered a small window of opportunity to visit the area. My only regret by the end of it was that driving all the way down and back up on the same day is a poor idea if you want to get out take pictures and explore. Nevertheless our day trip finally gave me a sense of the area and helped fill in some gaps on my sense of the geography of this part of the Western Ghats. 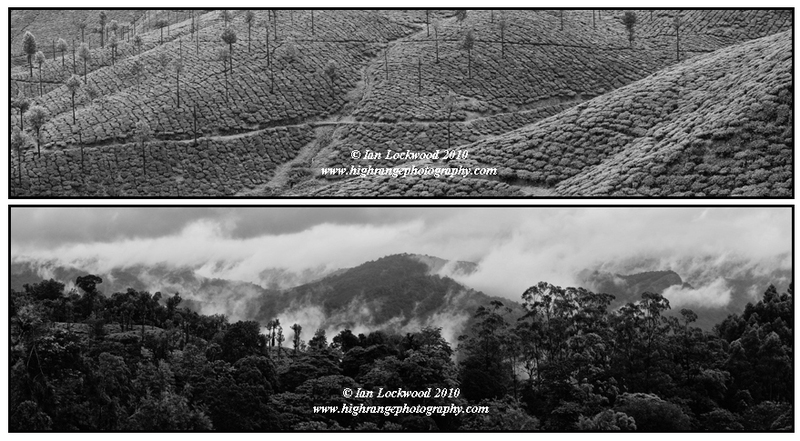 Contrasting views on the road to Sholayar Dam from Valparai. In the first image (above) tea carpets a patch of hills. In the second (below), at the periphery of an estate, tea is mixed with tropical rainforest. Habitats such as these harbor valuable biodiversity and are vital corridors for wildlife movement. Scenes from the road to Chalikudi from Valparai via Sholiyar dam. 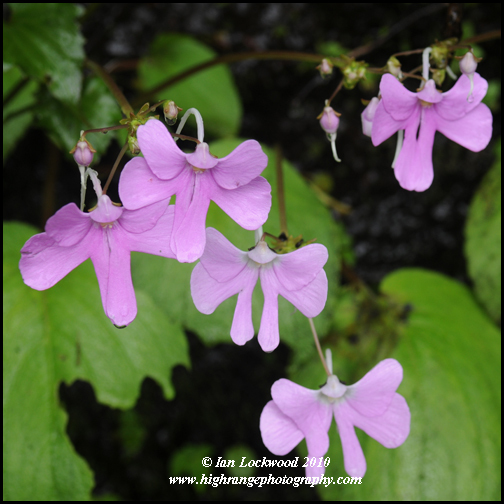 Impatiens scapiflora on the road near the Sholiyar reservoir. Lenny , John and I set out from Valparai in a light drizzle. The road winds its way through mazes of tea estates, settlements of worker’s colonies interspersed with forest patches. Some of these are the patches where NCF is working on restoration. We drove by a small herd of gaur, not bothering to stop knowing that they are across from our home in Kodai on a daily basis. The road winds by Sholayar dam (both upper and lower sections), which eventually feeds power and water into Kerala. After an hour of tea estates you cross the state boundary and head into the Vazhachal Division forests. The impressive canopy height is immediately apparent and the trees tower over you. 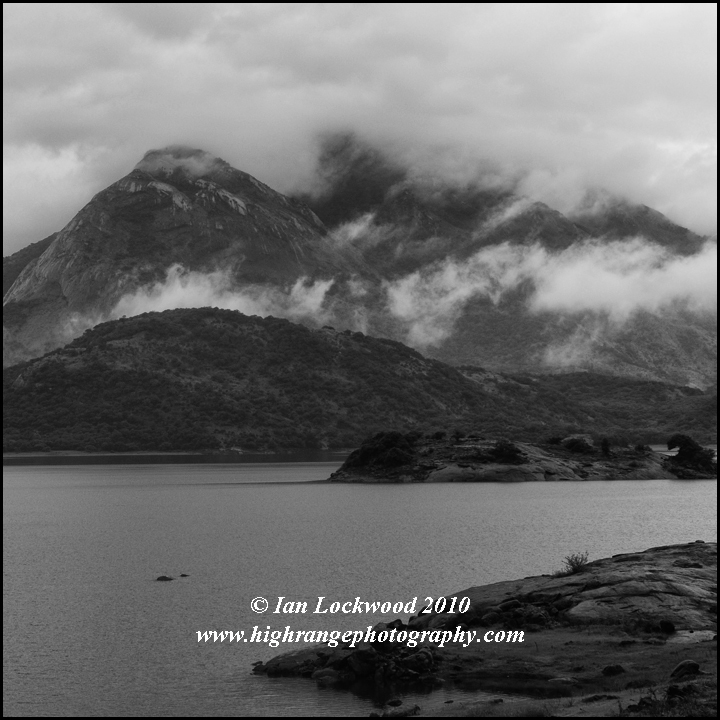 Of course, it was wet and there was an evocative monsoon gloom over the forest. It felt very much like the forest that one encounters in Sinharaja in terms of structure, plant composition and climate. The road condition is not great but, on the other hand, you can take normal cars down it with patience. There were only a few other vehicles that we encountered and for the most part we were alone. After several hours of puttering through fine forest and descending down hairpin bends the Chalikudi river came into sight through the misty foliage. Being in full flow it was a grand sight to behold. Steep granite cliffs rose about the raging water as it cascades in torrents over numerous rapids. We knew we had reached our destination when we encountered parking lots, signboards and restaurants that cater to the many tourists visiting the area from Cochin (only two hours away to the west). 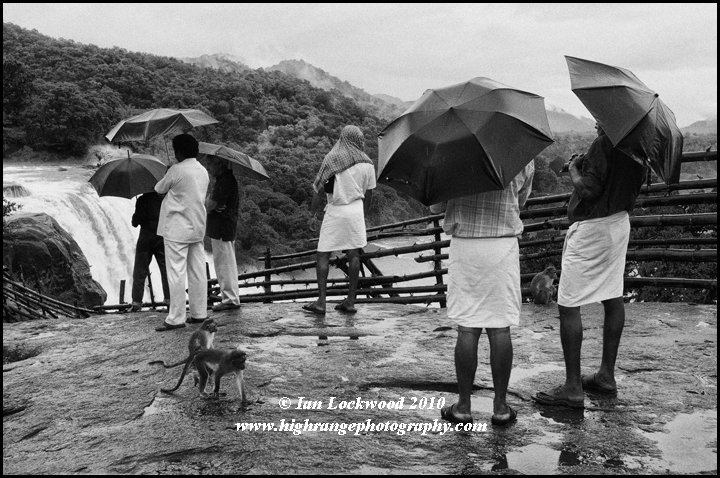 Rain soaked tourists visiting Athirappilly Falls in a monsoon shower. 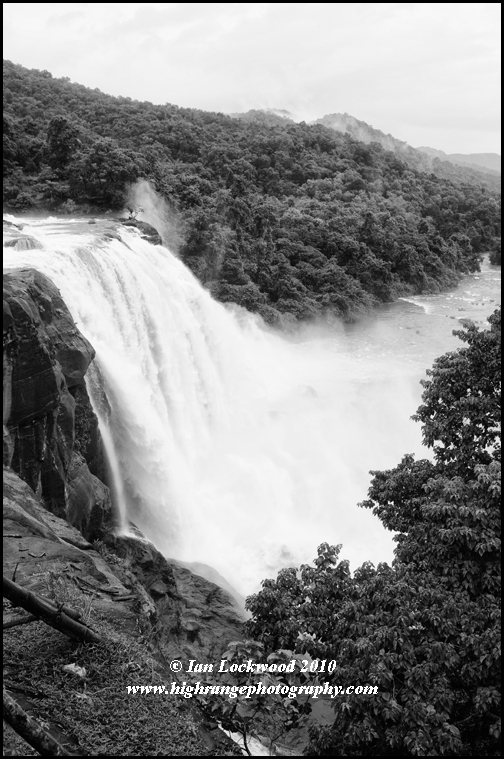 Athirappilly Falls is located at a curve in the river and marks the end of the natural forest and beginning of vast coconut and rubber estates. It is a picturesque waterfalls that has been in the news for all the wrong reasons. There has been a proposal to dam it above the falls that has gained some traction in the last few years. The Chalidkudy River is already dammed six times further upstream. Given the history with the Silent Valley proposalss and subsequent anti-dam movement in Kerala it has felt like déjà-vu for many conservationists. My sense was that things have cooled down but the incident has reminded us that the large-dam builders are not an extinct species in southern India! 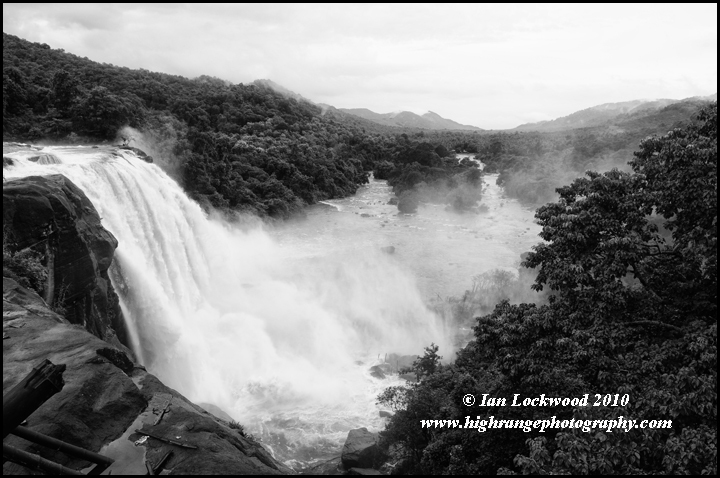 Athirappilly Falls looking west towards the coastal plains near Cochin. Surely one of the more unusual names of a viewpoint that you will stumble upon in the Anaimalais is the “Seen God” point. 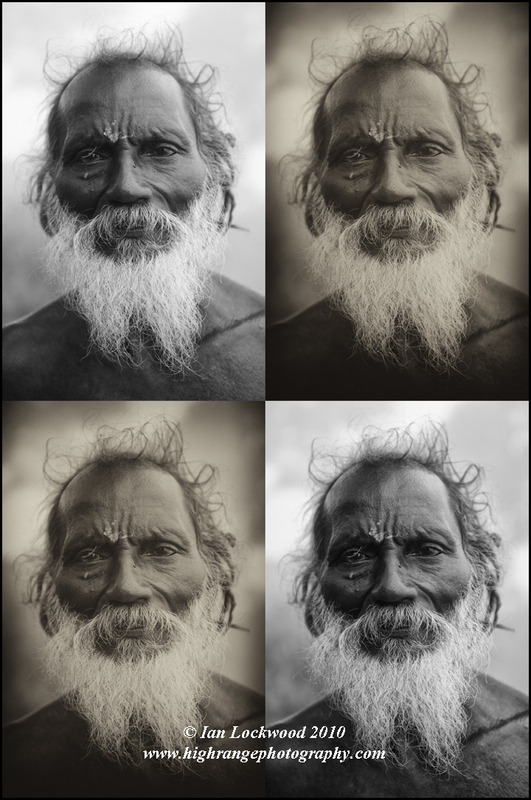 The name is derived from the man in this photograph who has lived in a cave hermitage nearby. I came looking for canopy views and hornbills, but ended up having an amusing conversation with him while thick, persistent mist enveloped the view. We had a very satisfying encounter with a troop of Lion Tailed Macaques (Macaca silenus) that was in the process of raiding the Puthuthottam Estate hospital. I was able to follow them into a patch of mixed plantation and natural vegetation forest to take the pictures in this post. 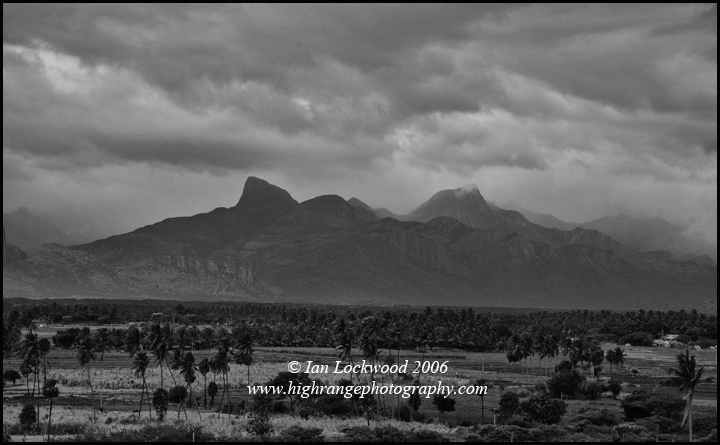 The South West was in full force when Lenny and I drove to the Anaimalais from Kodai via Palani and Udumalpet. We had hired the good services of AP John and his small Indica for the three-day rip. The Anaimalais Tiger Reserve (ATR) is a large and expansive protected area though it is interrupted by large patches of human settlements and modified landscapes. Most people looking for wildlife will head to Topslip, which is south-west of Pollachi. The Valparai area has traditionally attracted fewer people and for good reason. The accommodation options are limited and the area is dominated by large monoculture estates of tea. Access into the forests and high Grasshills area of ATR is strictly restricted and is not a viable option without significant bureaucratic gymnastics in Chennai and Pollachi. Clearing showers over the Aliyar reservoir looking east into the Anaimalai Hillss. The ride up to Valparai is worth the trip in itself. 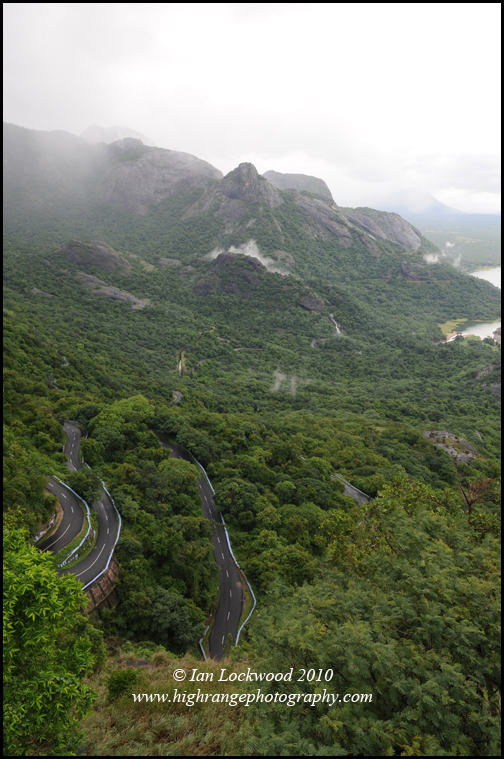 The ghat road up from Udumalpet via the Aliyar reservoir has an incredible 40 hairpin bends (the Battlagundu-Kodaikanal ghat only has one for comparison’s sake)! The road winds its way up a steep ascent with dry deciduous and thorn forest that quickly changes into moist-deciduous and then evergreen rainforest in the space of 10-20 kilometers. View looking north from hairpin Bend #9/40 on the Pollachi-Valparai road. At times this is a good location to see Nilgiri tahr. One of the most promising conservation projects in the Western Ghats is based out of Valparai where the Nature Conservation Foundation is working with several tea estates to restore degraded rainforest patches. The issue is close to my heart and something that I continue to learn and teach about. I’ve worked with the Vattakanal Conservation Trust to highlight their restoration work in shola/grasslands habitats changed by the widespread introduction of non-native tree species in the Palani and Nilgiri Hills. My 2005 article in Sanctuary entitled (by the editors) “the next big thing” described their work and the challenges of restoration in such sensitive habitats. In the article I mentioned the NCF work in the Anaimalais and have wanted to see it in person since. Lenny outside and inside of the Anaimalai Nature Information Centre (ANIC). NCF, of course, does a good deal more than ecological restoration and they have research projects in the Western Ghats, North-East and Andaman, Nicobar and Lakshadweep Islands. Before going over to the Anaimalais I contacted Shankar ‘Sridhar’ Raman and Divya Mudappa to set up a time to visit the NCF interpretation center. They were away but were able too hook me up with other NCF team members in Valparai. I first remember meeting Sridhar in Sengeltheri, (KMTR) in 1997 when he was conducting his dissertation study of birds in tropical rainforests of the Southern Western Ghats. I was on a short visit and was enjoying fine pre-monsoon weather to document different scenes including the view that led to the “Kalakad tree” image. Karthikeyan Vasudevan, of the Wildlife Institute of India, was also staying in the same hut conducting his research on amphibians. I remember being thoroughly impressed with their set up, passion for their work and individual studies. Along the road to Valparai NCF runs what must be the most effective and informative interpretation centers in the entire Western Ghats. The Anaimalai Nature Information Centre (ANIC) was our first stop on the Valparai plateau and Lenny and I were warmly welcomed. The location is a small bungalow immediately next to the main Valparai road in the Iyerpadi area. There are rooms dedicated to different habitats, species and challenges in the Western Ghats. A large number of attractively designed posters with beautiful digital pictures, write-ups and paintings by Maya Ramaswamy helps the viewer get a real sense for the range. They also have several publications for kids and adults and we left with lots of materials for the kids and school. I was happy to pick up an extra copy of Whitaker and Captain’s Snakes of India to replace the one that I had given to my Dhonavur friends. Our first point of contact at NCF was P. Jeganathan later Ananda Kumar talked to me about the plant nurseries. Jegan set us up to find the LTMs at the Puthuthottam estate utilizing the sharp skills of their watcher Joseph. Later that day he took us on a tour of the NCF nursery and interesting points near Valparai. 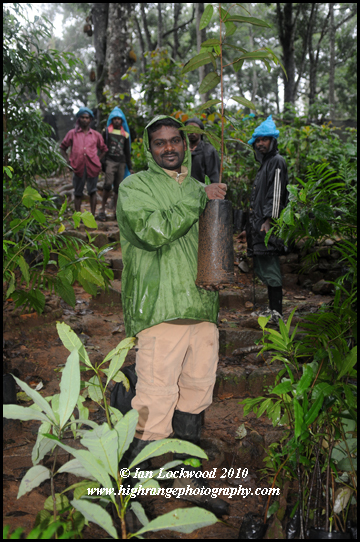 Satish, one of NCF’s Valparai team members, shows off a three-year old Cullenia excelsa sapling that he is getting ready to transfer from the nursery to a degraded forest patch in the a nearby estate. The NCF nursery was wet and misty on both days that I visited. Tata Tea has given them a section of one of their own tea nurseries to nurture rainforest trees that are collected from seeds on roadsides in forest fragments. These are documented, germinated and grown for the next 2-3 years. Once fragments are identified in tea-estate forests, sapling are taken from the nursery and planted during the monsoon season. The forest structure and conditions are carefully considered when choosing species to plant. Grazing has to be curtailed and invasive species removed when possible. Local communities, play a key role in education outreach and efforts to reduce collection of rainforest trees for firewood. A good deal of science and research goes into it and my observations were fleeting. Nevertheless, I came away impressed and hopeful in these small efforts to redress ecological ruin. 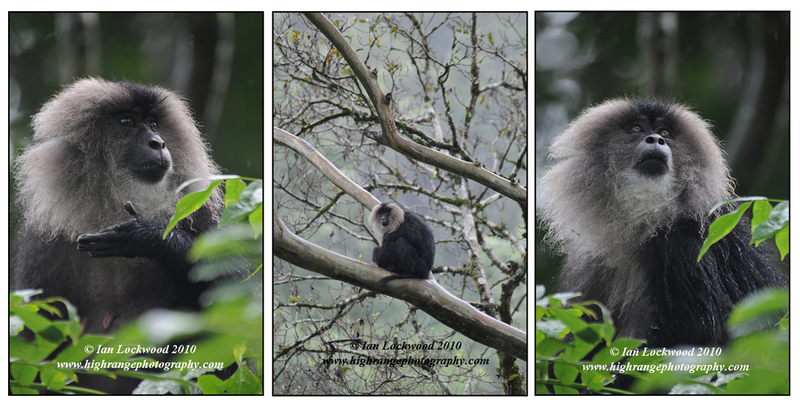 Lion Tailed Macaques (Macaca silenus) in mixed (plantation+ natural) forest near the Puthuthottam Estate hospital. Windmills with the Anaimalais and monsoon activity in the background. This is the eastern part of the range near Udumalpet. It was taken in 2006 but also during the South West Monsoon. 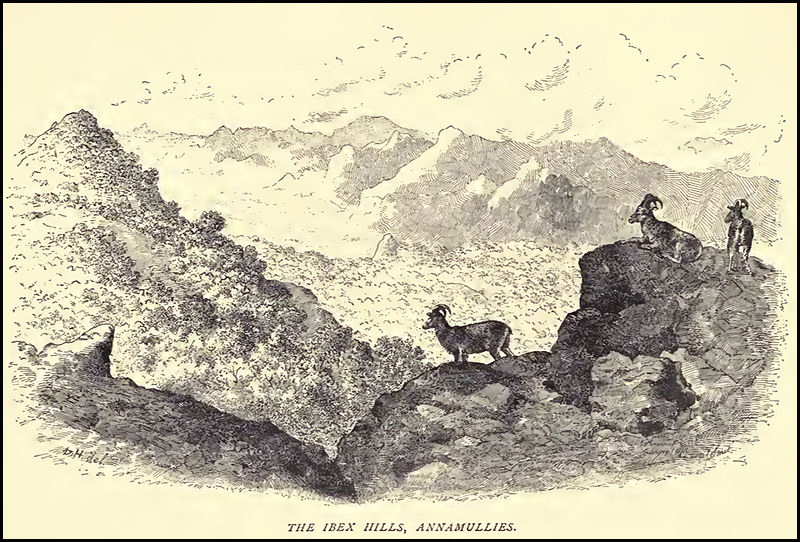 Douglas Hamilton’s sketch co of the “Ibex Hills, Ananmullies.” My guess is that this was based on a view looking east over Karian Shola where there are still Nilgiri tahr to this day. I climbed the peak in 1998 but do not have a comparative view to share. The sketch appears in his classic book on the area “A Record of Sport in Southern India…”, published posthumously in 1892. It is now available online via WIkipedia, though I have an original obtained from Bangalore’s Select bookstore in the 1990s. Further west from Udumalpet, a panoramic view of the Anaimalais on the Pollachi to Aliyar approach. Combined from six separate images but reduced in size for the web. (July 2006). Today the area around Udumalpet is a magnet for enormous wind farms generating significant amounts of electricity from wind flowing through the Palghat gap. The ‘elephant hills’ are indeed remarkable for their diversity and large protected areas. But there is also a good deal of modern human-influenced landscapes in the form of expansive tea estates, gigantic hydroelectric reservoirs and forests of teak and eucalyptus. The area has enjoyed protection over many years and today the Anaimalais is one of the 2nd largest (the largest in the Nilgiri Biosphere reserve) protected areas in the Western Ghats combing sanctuaries from Tamil Nadu as well as Kerala. In 2009 the large Indira Gandhi Wildlife Sanctuary was upgraded to the Anamalais Tiger Reserve (ATR), giving its protection a higher level of importance. Some of the hiking that we traditionally do out of Kodai is in the ATR and favorite hiking places such as Manjampatti and (parts of) Kukkal are actually in its jurisdiction. Map showing significant points from the 2010 Anaimalais monsoon visit with Lenny. The area included the Anaimalais, Palani Hills, High Range and Cardamom Hills. While I work on honing my Arc skills I have stitched together pieces from Google Maps/iPhoto. The insert is derived from a 30 meter Digital Elevation Model (DEM) of the same area as rendered on Global Mapper. Click on the image for the full 20” view. I have had the good fortune to visit the Anaimalais on several occasions over the last 20 or so years. Most of the visits were on trips between Kodai and Munnar, as I passed through Chinnar and the dry thorn forests in the Marayoor valley. In 1993 my cousin Anna and I visited Ragupathy Kannan at his field station in Top Slip where he was conducting a landmark study on the Great Pied Hornbill (Buceros bicornis). 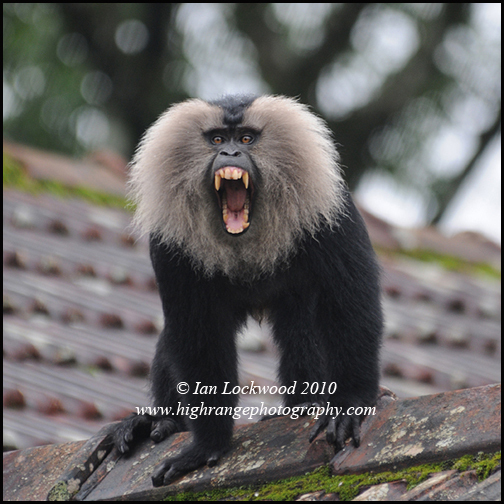 A few years later I returned to Topslip and Valparai to photograph Lion Tailed Macaques (Macaca silenus). I had several rewarding LTM encounters in Anaigudi and then the reliable Puthuthottam estate near Valparai. But that was in an era of film before digital equipment was available. Places like Valparai (and even Munnar) were sleepy and neglected by roving tourists. Today, Valparai is changing and is being touted as the next great hill station in Tamil Nadu. 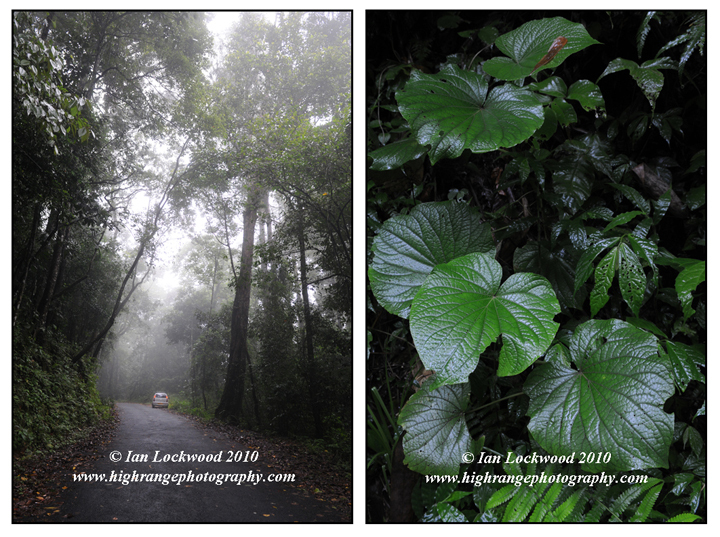 This trip, at the end of our summer holidays, was designed to fill in some gaps in my fauna imagery to accompany the Western Ghats landscapes. I was also eager to explore the back road to Chalikudi and make contact with the Nature Conservation Foundation. Lenny came along too and it was a treat to share the places and adventure with him. Anaimalais as seen from near the Udumalpet-Munnar road turnoff. (July 2006).